The therapsids arose during the Middle Permian, following the decline of the pelycosaurs. This diverse collection of later synap-sids persisted until the Early Jurassic Epoch; the therapsids were displaced by diapsids, a group that included lizards and the early dinosaurs. With the therapsids, the elongated, sprawling body plan of the pelycosaurs gave way to the compact, sturdier build seen in many theraspids. A reduced tail and longer legs suggest that these animals were becoming better walkers than the belly-dragging pelycosaurs. The reduction of tail length also reduced the surface area of the skin; this eased the loss of body heat and allowed these animals to maintain a steadier body temperature. This move in the direction of endothermy—the state of being warm-blooded—was a significant innovation seen in true mammals. Three important groups of therapsids were the dinoceplalids, the dicynodonts, and the cynodonts, Of these, only the latter two groups managed to survive the great Permian-Triassic mass extinction, one of the most devastating extinction events in the history of the Earth. If these two groups had not survived, the modern world would be inhabited by a different assemblage of creatures than is known today. There are about 40 genera of these carnivorous and herbivorous animals known from Late Permian fossil beds in Russia and South Africa. The name dinocephalids, or "terrible heads," describes these creatures' large heads, many of which were adorned with a variety of bony plates, horns, and jutting protuberances. Titanophoneus and Anteosaurus, both from Russia, represent the successful predatory body plan of the dinocephalids. These two animals were stocky and heavily muscled, with deep, large skulls that measured about 24 inches (60 cm) long. Their front legs were longer and more sprawling than the hind limbs, which were more similar to the upright legs of later mammals. A distinctive feature of the dinocephalid predators was interlocking incisor (front) teeth and long, pointed canines that jutted from the front of the upper and lower jaws. These teeth interlocked and were visible outside the mouth when it was closed. Such teeth would have been effective at grabbing and clamping down on any size prey of the predator's choosing. Titanophoneus was more slender in build than Anteosaurus; Titanophoneus also retained a longer tail than other typical dinocephalids. These were large predators. Some specimens were up to 20 feet long (6 m) and in life probably weighed about 1,100 pounds (500 kg). This size is comparable to that of a modern-day rhinoceros. Among the larger herbivorous dinocephalids was Moschops, also from Russia. This was another large and bulky animal, with a body plan similar to that of Anteosaurus. The head of Moschops was smaller, however, and its jaws were lined with peglike teeth designed to pick away at vegetation. Moschops was about 16 feet (4.8 m) long. Its skull was about four inches (10 cm) thick in places, suggesting that individual animals may have engaged in head-butting contests to win mates. 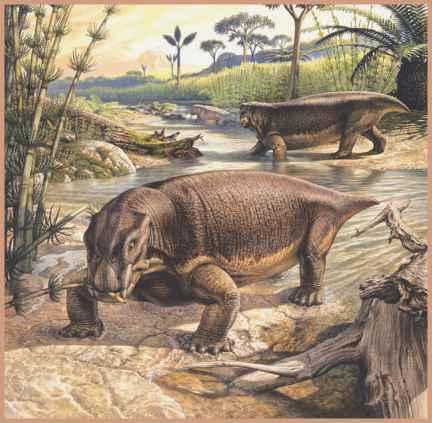 Dicynodonts included about 70 known genera; they were the most populous herbivores of the Late Permian. The dicynodonts ranged in size from that of small rodents to specimens 10 feet (3 m) long. Most dicynodonts were wiped out by the end-Permian extinction, with the exception of some taxa that lasted through the Triassic Period. The name dicynodont means "two dog teeth" and refers to the presence of two long tusks, or canines, in the upper front jaw of these animals. As formidable as these teeth may have appeared, the dicynodonts were actually plant eaters. Some dicynodonts, such as Lystrosaurus, had no teeth other than these canines. These animals used a sharp-edged beak to snip plants that were then ground to shreds against bony plates in the roof of the mouth. Lystrosaurus was a medium-sized creature, only about three feet (1 m) long. Its body was stout, its legs were short and sprawled in the front, and it had a very short tail. The lifestyle of Lystrosaurus could be likened to that of a small hippopotamus: It waded through a swampy habitat, feeding on low-growing vegetation such as ferns and gymnosperms. Lystrosaurus capitalized on an uncomplicated formula for success, and it became one of the most widely distributed early amniotes. Its fossils have been found in China, Russia, South Africa, India, and even Antarctica. This distribution was used as biological evidence to support the tectonic plate movements that once connected these now widely separated landmasses. The plant-eating dicynodont Lystrosaurus capitalized on a simple anatomical formula for success and became one of the most widely distributed early amniotes. of the Late Triassic Epoch, a time when the first dinosaurs were emerging. Placerías was probably the largest herbivore in its habitat; it measured about 10 feet (3 m) long. Placerias was similar in appearance to Lystrosaurus, but the skull of Placerias was longer, and its neck was more developed. In the front of its jaws, Placerias had a more birdlike beak than Lystrosaurus; also, Placerias's dual tusks hung down from the sides of its mouth. The cynodonts ("dog teeth") were a group of small synapsids that grew more plentiful and specialized during the Triassic Period. The cynodonts were most likely the ancestors of mammals and developed several key adaptations that affiliate them closely with the radiation of early mammals during the Mesozoic Era. The evolutionary transformation of synapsid reptiles to mammals is one of the clearest cases of transitional modifications in the fossil record of vertebrates. Even early cynodonts such as the long-nosed Procynosuchus (Later Permian, southern Africa) had affinities with true mammals. In Procynosuchus, such features as an enlarged nasal passage; a small but increasingly complex mosaic of jaw muscles, teeth, and bone; a more flexible joint connecting the neck and spine; and other anatomical features gave this small animal a look reminiscent of a modern rodent. While the overall appearance of Procynosuchus is strikingly mammal-like, however, the story of the transition from reptiles to mammals is told most clearly by examining stages in the development of the jaws of these animals. The mechanics of the cynodont jaw was a particularly important step in the direction of true mammal traits. During the early evolution of the synapsids, the lower jaw was composed of many different bones. Over time, especially in the cynodonts, some of these individual jawbones either diminished in size or were displaced entirely by one larger bone called the dentary. The consolidation of the lower jaw into one sturdy mass was accompanied by a great simplification of the muscles associated with jaw mechanics. Instead of having three separate and equally dominant muscle groups for the jaw, as did early synapsids, the cynodonts developed the more mammallike trait of having two more massive muscles occupying more and more space within the back of the skull. These changes to the cynodonts' jaw design are significant because they provided these ancestors of mammals—and eventually mammals themselves—with an impressive suite of chewing adaptations. Whereas most reptiles can move their jaws only up and down, mammals are able to chew using a triangulation pattern; this is a key adaptation for the development of improved dentition for chewing meat or a wide variety of vegetation. This adaptation resulted in the diversification of cynodont herbivores and insect-eating carnivores with increasingly complex batteries of tiny teeth. Another gradual but radical anatomical change to cynodont jaws resulted in the development in cynodonts of mammal-like hearing. In early synapsids such as Dimetrodon, the lower jaw consisted of numerous small bones at the rear of the skull that formed the jaw joint. The eardrum was behind the jaw. In the cynodont Thrinax-odon, a change can be seen in the arrangement of these smaller jawbones. As the dentary bone became larger, and some of the small bones at the back of the lower jaw formed a new type of jaw joint, several of the remaining bones became smaller and migrated toward the ear region. In the earliest mammals, the same small bones were present but were no longer associated with the jaw joint. Instead, they became part of the hearing mechanism. Thermoregulation, the control of body temperature, was an additional challenge for land animals. Tetrapods need to attain a certain optimum body temperature before they can become fully active for walking, feeding, hunting, and other physical activities. Large synapsids such as the pelycosaurs and dicynodonts relied on large body size to slow the gain or loss of heat, but this large size also made them relatively slow moving. Smaller animals, such as the cynodonts, did not have this size advantage. Instead, cynodonts probably maintained their body heat by eating frequently and remaining active to burn calories. Paleontologist David Norman suggests that the improved jaw designs of cynodonts had an important role in maintaining their energy level. The development of chewing enabled them to digest food more rapidly. A gradual separation of the nasal passages from the mouth cavity in mammal-like reptiles also allowed them to eat and breathe at the same time. Norman suggests that the need "to breathe quickly and regularly would not have been so great if they had been low-energy animals." 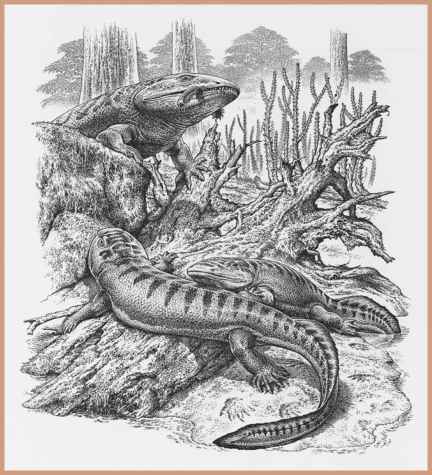 Cynodonts were small; most measured 24 inches (60 cm) long or less. The Early Triassic taxon Thrinaxodon (South Africa, Antarctica) was about 17 inches (45 cm) long, including its catlike tail. Thrinaxodon serves as a good example of the changes that took place in the posture and gait of mammal-like reptiles. Whereas the pelycosaurs and other synapsid groups had a sprawling posture, Thrinaxodon developed a more efficient gait through modifications of the hip girdle and hind legs. The result was legs that could be brought closer to the body in a semierect posture. The anatomical changes needed to make this happen included modifications to the shape of the leg bones and modifications to the shape of the muscles that powered them. Cynognathus was a doglike carnivore. At about 3.5 feet (1 m) long, it was one of the largest of the cynodonts. Evolving during the Middle Triassic Epoch, Cynognathus was undoubtedly a fierce predator, and it represented another important milestone in the evolution of true mammals. The jaw of Cynognathus included three tooth designs, each contributing to the capture and consumption of prey. Cynognathus has long canine teeth for stabbing prey; small, pointed incisors for gripping prey; and serrated cheek teeth for shredding the flesh of its victims. The dentary bone of Cynognathus was also a good example of the consolidation of the lower jawbones: Ninety percent of this animal's lower jaw was made up of this single bone. An even more doglike cynodont was Probelesodon, from the Late Triassic of Argentina. Its limbs were more fully erect than those of earlier cynodonts and gave this dog-sized predator speed and maneuverability. Some fossil specimens of Probelesodon show tiny pits on the snout; this suggests that these animals had doglike whiskers. If this was the case, one might further speculate that these animals were fur covered, another adaptation seen in mammals that helps regulate body temperature.